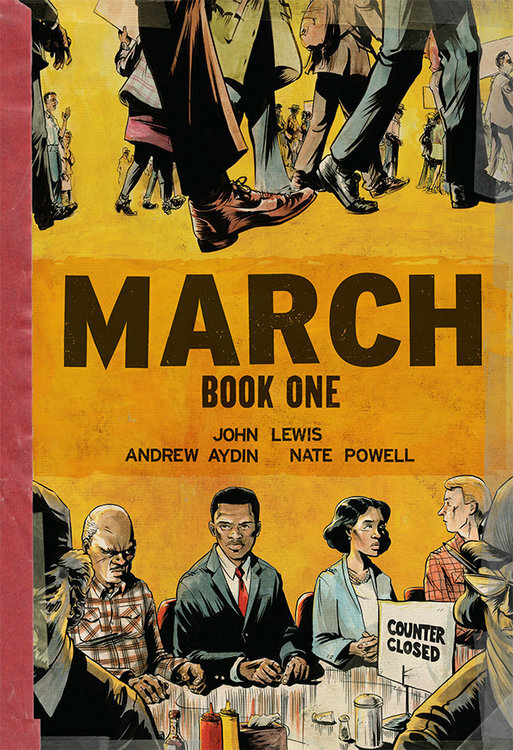 These graphical biographies cover the early years of John Lewis, now a congressman, but formerly a preacher and activist with the Student Nonviolent Coordinating Committee. Book one revolves around the desperate attempts by African Americans to desegregate southern restaurants. It sounds simple enough: walk up to the counter and ask for a cup of coffee and perhaps a couple of slices of toast. In reality, nearly all southern commercial establishments from the Civil War through the 1960s were designated off-limits to people of color. The act of entering, sitting, and ordering was illegal and could be met with beatings and incarceration (and though it is not covered in the book, terrorism, see The Warmth of Other Suns). To chose a nonviolent response while whites screamed, hit, kicked, and spit on you was an act of remarkable bravery. Book two describes the 1961 Freedom Rides by blacks protesting segregation on interstate buses and bus terminals. Protesters were met with firebombs, the KKK, and police beatings. 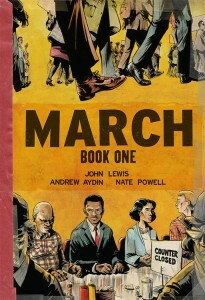 The cartooning and simple language make the books accessible to readers of all ages, who, if they are paying attention, will recognize that current protests over #black lives matter have deep roots and that the work of generating equality has not yet been achieved in America. On the surface this is a fictionalized account of two women who made one another famous during The Great Depression: Dorothea Lange, a government employed photographer, and Florence Owens Thompson, the subject of what may be the most famous photo of the era, Migrant Mother. 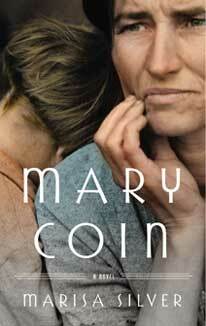 Using available historical information (I know because I checked), Marissa Coin, the author weaves together the lives of these two women and brings to life the endurance of strong women getting by during extraordinary times. Underlying the narrative is a discussion of the nature of history and photography. History being a series of perhaps unreliable and haphazardly preserved recollections interpreted by future observers and photographs turning out to be exactly the same. Pictures are no more than the preservation of a second in time that might or might not reflect reality and whose interpretation relies as much on the viewer as it does the photographer or the subject. Every once in a long while you read a book by an author you recognize is much, much smarter than the rest of us. Christopher Hitchens is one of those. Eula Biss is another. 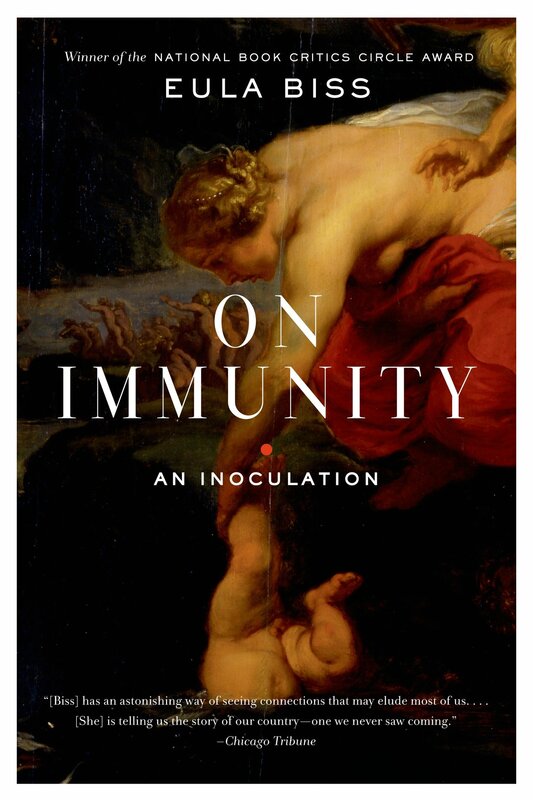 I picked up On Immunity thinking I was going to learn about New Age parents thinking they are protecting their children by forgoing inoculations. And yes the book does dig into the science of how vaccinations succeed and how pseudoscience survives on the internet forever. The study purporting to demonstrate that some vaccinations could lead to autism, for example, has been so thoroughly discredited as to exist only in a world inhabited by believers in alien abductions. It would be a mistake, however to think On Immunity is only an account of germs and antibodies. Rather, it is a work of philosophy covering the nature of who we have become as overprotective parents, men and women so concerned about perceived threats to our children, and our desires to keep them immortal like Achilles, that we are in practice creating national and international health hazards that will be borne by the poor and underserved in the healthcare system. Our desire to remain undead forever is an invitation for Biss to discuss the inherent fear of parenting and the curse of Dracula who never died, and like a bacterial infection survived on the blood of others. I know it’s Pesach so no I did not make this bread this weekend. 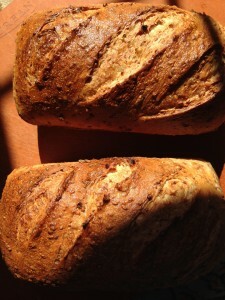 Made these two a couple of weeks ago: oats, flax, whole grain barley, flour, and whole wheat flour. Took one loaf to a department meeting and watched it disappear like it was being filmed with a time-lapse camera.